Cinnamon Bark (Cinnamomum verum) Vitality™ essential oil is a concentrated and potent flavor that complements a variety of classic culinary treats. Not only is Cinnamon Bark Vitality oil used for its unique and spicy notes in recipes, but it’s also a great dietary supplement and important part of Thieves®, Abundance™, and Inner Defense® essential oil blends. Using Cinnamon Vitality oil brings a warm taste and sensation to your favorite dishes. Taking Cinnamon Bark Vitality essential oil as a dietary supplement can support healthy digestion and help maintain a healthy immune system. * Cinnamon Bark Vitality Essential Oil Uses: Dilute 1–2 drops with V-6™ Vegetable Oil Complex in a vegetarian gel capsule and take as a dietary supplement to support your regular digestion. * Turn your NingXia Red® shot into a “Hot Shot” by adding a drop or two of Cinnamon Bark Vitality. Take a banana smoothie to a sweet new level with a drop of Cinnamon Bark Vitality. Use a drop to spice up your hot cereal. Substitute Cinnamon Bark Vitality in any recipe that calls for ground cinnamon. 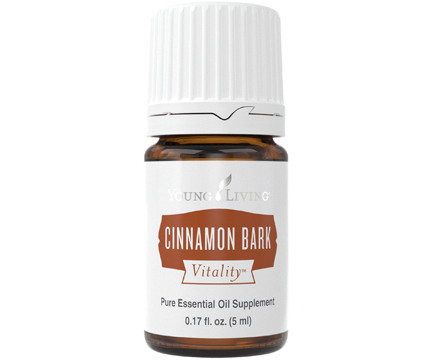 Cinnamon Bark Vitality Essential Oil Product Information Page *These statements have not been evaluated by the Food and Drug Administration. This product is not intended to diagnose, treat, cure or prevent any disease.